Sea Hunt sales manager Johnny Craig was at the Norwalk International Boat Show to show the company’s offerings in the saltwater market. Sea Hunt Boats is not in every boat market, but it’s not looking to take on more dealers. The company’s not trying to build more boats, even though its dealers would gladly take more. And it’s not going to build a 40-foot center console to feed into that popular market segment. Sea Hunt has steadily gained market share in the 18-to-30-foot saltwater market during the past decade, although the company is fairly quiet about its success. The Columbia, S.C., boatbuilder sees dealers making three to four turns, on average, while they clamor for more boats. But Sea Hunt has found its sweet spot, sales manager Johnny Craig says, and it’s not looking to take on any more than the 34 dealers in its network. The company, founded in 1995 by Vic and Bubba Roof, a father-son team, now has a 170,000-square-foot facility and is not computerized, Craig says. Bubba Roof, 44, has the majority stake in the company and runs it with partner Joel Moss. “Bubba is there every morning at 6 and checks the molds,” Craig says. “He invests in inventory of purchased items. He keeps it in stock so he can deliver those eight boats each day, and keeps track via a pad of paper and a pen. Bubba is the only one who submits orders to be produced. 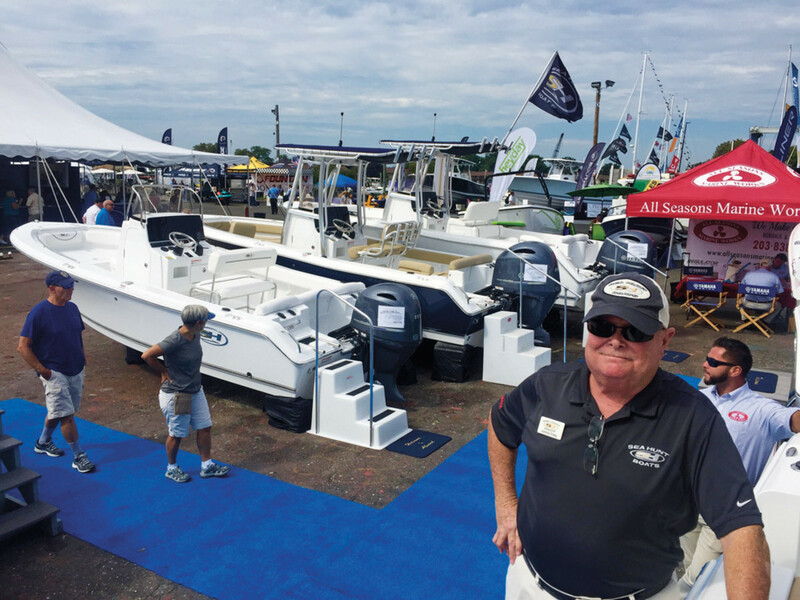 Steven Bolanos of All Seasons Marine Works, a dealer who was displaying seven Sea Hunt models, as well as Regulator and Pursuit, at the show, says his business would gladly take more Sea Hunts. “We sell them as fast as we get them,” Bolanos says. Sea Hunt had tried to build beyond those 2,000 boats, but scaled back again to ensure the quality and oversight on which the company has built its reputation. 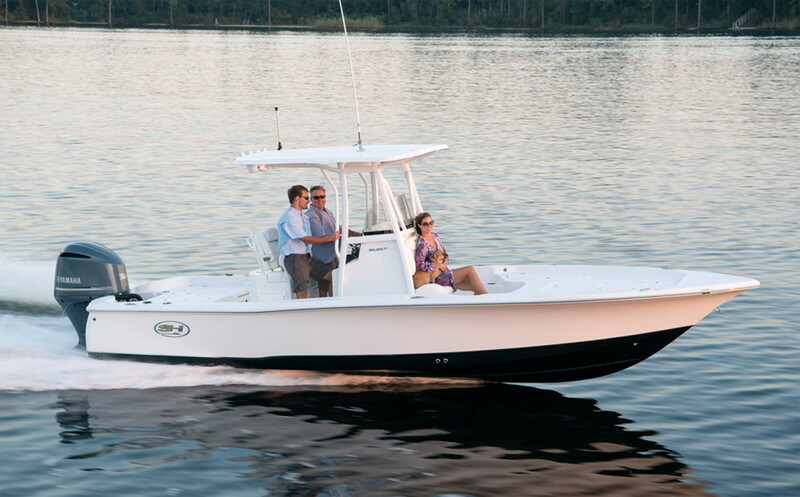 Sea Hunt has steadily grown over the past few years, offering a variety of center consoles, such as this bay boat. Roof also does not spend on print ads, relying on word of mouth. The company is debt-free and relies on its buying power to keep prices low. Craig did not want his boat show prices listed in print, but he argued that the boats are among the most competitively priced without sacrificing fit, finish and quality. Craig came from Stingray Boats, and he says he was captivated by the enthusiasm and excitement at Sea Hunt. There are more than 100 workers at the plant, although Craig declined to be specific about the work force. The dealer network is in the Southeast and Northeast, and there are a couple in Texas, he says. The brand has seven lines, many of them center consoles — the Gamefish Series, the BX Bay Boat Series, the Ultra Series designed for comfort, the Triton Series — billed as “an affordable boat with excellent performance” — the dual console Escape Series, the center console Edge Series and the RZR Stepped Hull Series.